Senator Bernie Sanders introduced his 'Medicare for All' bill on Wednesday, a plan that would provide health care for all Americans and diminish -- if not eliminate -- the need for many to carry private insurance. The Hill notes that prior to its official announcement, David Merritt, executive vice president of America’s Health Insurance Plans, released a statement of opposition to the measure. "Whether it’s called single-payer or Medicare for All, government-controlled health care cannot work…It will eliminate choice, undermine quality, put a chill on medical innovation, and place an even heavier burden on hardworking taxpayers," Merritt said. It’s not entirely surprising that an insurance company would balk at legislation that could make deep cuts to its revenue, but Bruce Japsen of Forbes pointed out that there may be a path both sides would find acceptable. 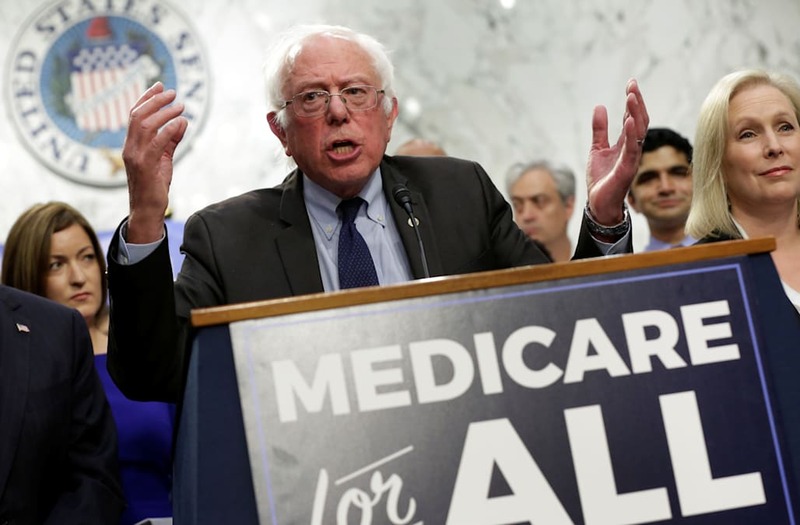 "Insurers appear open to offering the liberal Vermont Senator a path to expanding coverage if it involves bolstering private Medicare Advantage plans, which insurers sell to seniors via contracts with the federal government," Japsen notes. That said, Quartz reports, "According to Adam Green, the co-founder of Progressive Campaign Change Committee, a grassroots organization that worked with Sanders in developing the bill, this is a first step to building viable support behind the idea of a universal health care…"
Despite it being viewed by many as more of a positioning tool than legislation that has a chance of being passed in its current state, the bill has made waves in Washington. During Wednesday’s White House briefing, press secretary Sarah Huckabee Sanders said of Sanders’ plan, "not only does the President not support it, but America doesn’t support it, or Bernie Sanders would be sitting in the Oval Office right now."